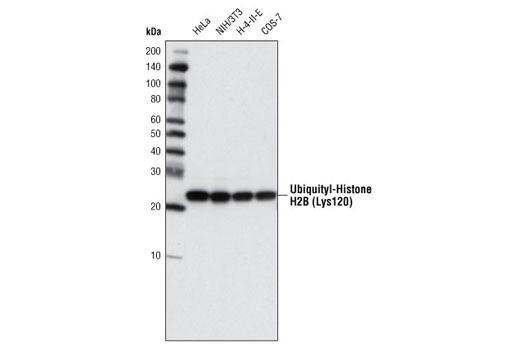 Western blot analysis of extracts from various cell lines using Ubiquityl-Histone H2B (Lys120) (D11) XP® Rabbit mAb. 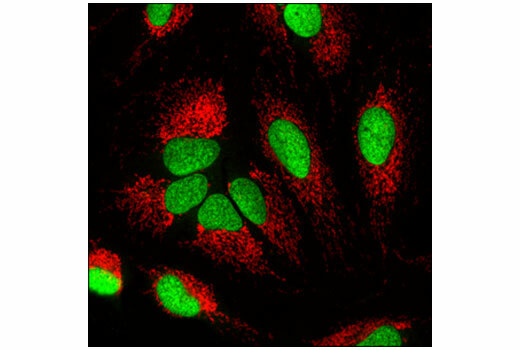 Confocal immunofluorescent analysis of HeLa cells using Ubiquityl-Histone H2B (Lys120) (D11) XP® Rabbit mAb (green) and COX IV (4D11-B3-E8) Mouse mAb #11967 (red). Chromatin immunoprecipitations were performed with cross-linked chromatin from HeLa cells and either Ubiquityl-Histone H2B (Lys120) (D11) XP® Rabbit mAb or Normal Rabbit IgG #2729 using SimpleChIP® Enzymatic Chromatin IP Kit (Magnetic Beads) #9003. The enriched DNA was quantified by real-time PCR using SimpleChIP® Human γ-Actin Promoter Primers #5037, SimpleChIP® Human γ-Actin Intron 3 Primers #5047, SimpleChIP® Human GAPDH Promoter Primers #4471, and SimpleChIP® Human GAPDH Intron 2 Primers #4478. The amount of immunoprecipitated DNA in each sample is represented as signal relative to the total amount of input chromatin, which is equivalent to one. For optimal ChIP results, use 2.5 μl of antibody and 10 μg of chromatin (approximately 4 x 106 cells) per IP. This antibody has been validated using SimpleChIP® Enzymatic Chromatin IP Kits. 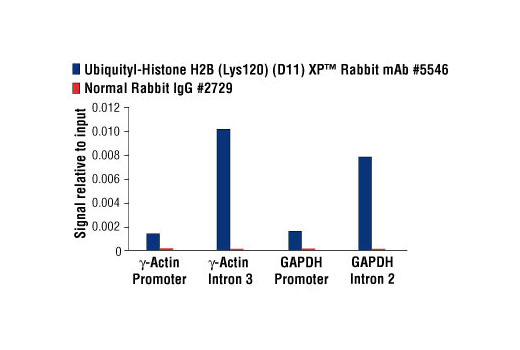 Ubiquityl-Histone H2B (Lys120) (D11) XP® Rabbit mAb detects endogenous levels of histone H2B protein only when ubiquitylated on Lys120. The antibody does not cross-react with other ubiquitylated proteins or free ubiquitin.